'Empire' Star Jussie Smollett Huge Holiday Donation ... $125k For Charity!!! Here come some feel-good vibes, courtesy of "Empire" star Jussie Smollett, who is donating a ton of cash to charities heading into the holidays. We're told Jussie is taking proceeds from his tour and latest album, "Sum Of My Music," and passing along $125,000 to charities supporting his most beloved causes. 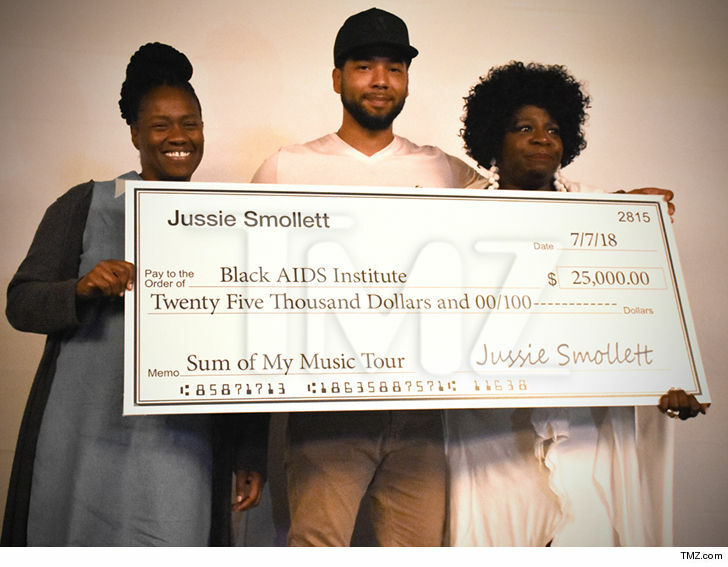 Jussie is paying it forward to groups like the Black AIDS Institute, Flint KIDS, South Africa's SKY Foundation, the Trayvon Martin Foundation, the Human Rights Campaign, Know Your Rights Camp, ACLU and the Anthony Burrell Dance School. Jussie, who plays Jamal Lyon on "Empire," is no stranger to good deeds. As we reported ... he recently hooked up a double amputee, 6-year-old Kayden Kinckle, with a handicapped-accessible van in a tearjerker of a surprise. Yeah, Jussie's locked up a spot on Santa's nice list.